This motorized positioning table is made of aluminum alloy with an elegant black anodized surface. It provides 50 mm of travel at a maximum speed of 40 mm per second. The drive mechanism is lead screw. The bench size is 150 X 150 mm and has a body weight of 2.8 Kg. The maximum load of this stage table is 20 Kg. 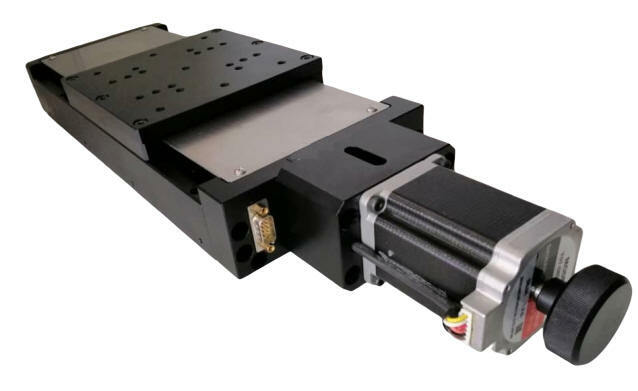 also available with a servo motor and optical encoder. The knob mounted on the motor allows for manual adjustment. This knob may be replaced with an optical encoder for precision position verification. This stage is compatible with OES' line of Motion Controllers..